Like I’ve been telling you guys this is my year to be BEYOND uncomfortable. That means that I have had to step outside my comfort zone and do somethings I normally wouldn’t do. If you follow the blog then you know I am not shy, I do however hang with a group of people I am extremely comfortable with. No more!! Wait I will hang with them they are my village, but I am opening up to the possibility of exploring friendships with others. We as moms don’t do that often enough, maybe it’s a trust issue, maybe we don’t have time to get to know others, whatever it may be I am trying to do something different. So what do you do when you want to make friends?! You find places to go where people you want to get to know will be. This is how I ended up at the Pink Party! 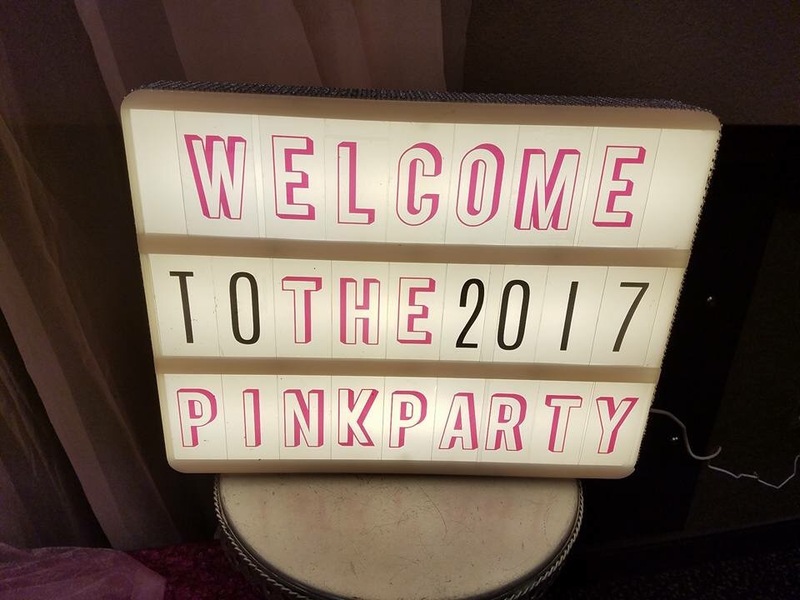 The Pink Party Retreat is a women’s empowerment retreat that allows women to be transparent, to laugh, to cry, to be angry, to just be YOU! My kind of place. But wait I don’t know these people, will they be accepting of a new comer, will they embrace me?! We as moms, as women still ask these questions even when we are grown, it’s in our nature. I for one am an outspoken, sarcastic, black girl magic loving so and so, it can be a lot for some people to handle. My first encounter, I met my soul friend Clo, she was just as HEY Girl as I am, one sentence into our conversation she changed my name, I like her. I walk through the doors of the Kalahari resort and there are women, girls, people all over. Someone in a pink shirt says we will register you momentarily. I take a seat on the couch with women I do not know. Two seconds go by and we all become good friends, sharing snacks, life stories waiting for the party to begin. The doors open…It’s time to join the party! LET…ME…TELL…YOU..I have never felt so much love, so much strength, so much fire and passion in one place. It was like a bunch of magical souls that were meant to be had finally found a home. I have never before experienced that outside my family, my village, my crew. It was AMAZING!! Below you will find words of wisdom I obtained from the speakers featured. Take them let them burn like a consuming fire in your mind and then go have your party. Encourage someone, pour into someone, be there for someone, forgive someone and while you’re doing all of that be your FANTASTIC, PASSION DRIVEN, BEAUTIFUL SELF. We have to be intentional about what we do and say without being mean girl. My battle scars are my beauty marks. The constant battle between light-skinned and dark skin people of color is bullying that we don’t recognize. Learning to love yourself can be revealed when it’s time for you to grow. Growth will reveal who really has your back. In your season of brokeness you can discover yourself and set guidelines and boundaries to show others how to love you. In order to get to destiny everything was necessary. When you don’t know your purpose you hunger and thirst for it. The storm that was meant to take me out was the storm that was protecting me. Love is what love does. Be expecting of a miracle God would not take something without giving you greater. We as sister don’t like to see each other walking, we get off on having each other beg. If I have a need and you have it meet it. Some of us don’t know how to help , we hurt when we speak so if you not coming to help don’t come. Sometimes a blessing is not for you God entrusts us to give it away, to use it to nurture others. What do you do when you’ve closed the doors locked the windows and you discover you’ve locked the intruder in the house with you, when the enemy has come into your home to destroy you? Why are we silent about our childhood abuse what makes us not cry out literally? Why do we allow shame to dictate how we ask for help? How can we remain still in our singleness? Previous Post Being Nanekia…Girl Trippin!